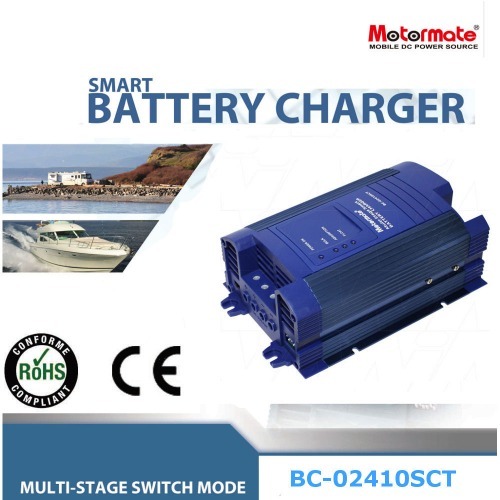 The Motormate BC series of chassis mountable compact AC-DC power supplies/battery chargers use the latest switch mode technology providing fully automatic battery charger suitable for all lead acid battery technologies - SLA, AGM, Gel, Flooded Wet Cell and Calcium. The input and output are completely isolated. The device can also be used as a power supply to run electronic devices constantly.
. Also features a thermal control cooling fan with autostart and a 4 colour LED charge mode display. Other models are available within the BC series with outputs suitable for 12VDC or 24VDC. Featuring a tough anodized aluminium case with mounting cover and a wide range operating temperature, overload and short circuit protection with LED indication.